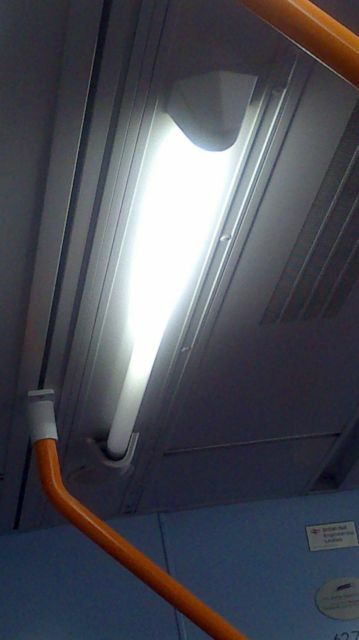 Lighting-Gallery-net - Other bulbs and Lighting stuff/EOL Or Murcury staffed 4ft Fluorescent On South West trains. EOL Or Murcury staffed 4ft Fluorescent On South West trains. This was taken on my phone going to a london furs meet, this carriage had 3 of these doing this, one end much dinner plus black ending loads. The lamp is EOL and either it is on SRS or quickstart ballast or the starter is weak or of low quality so it isn't triggered on a switch start ballast, so the lamp rectify continuously and the mercury migrate from the bad electrode to the good one.